Cooking pasta for a crowd should be your go to dish. The best dish to serve a crowd is pasta as the main dish and can be easily prepared and always tends to please the group. Do you want to know the secrets that will help you in cooking pasta for a large group? Cooking pasta should make your life easy when getting ready for a party. If you were put into a position where you needed to prepare pasta for a huge crowd, there isnt any need to get stressed out. Over the years, I have found that a simply prepared dish will be the one that will be the hit of the party. The old adage of less is more, applies to pasta as well. I had a Chef that always lived by three ingredients or less rule. When he first told me that our menu would revolve around this, I have to admit that I thought this was a little crazy. As he continued to bless plates with this idea, the theory began to sink into my sometimes hard head. My suggestion to you would be to experiment with some of your favorite local ingredients. While you are at it, please use local and seasonal, not only will your guests appreciate the dish even more, you also will be supporting your local farmer in the process. By all means if you are purchasing pasta, please get the best you can afford. Making your own pasta is another way to cut costs, as well as the taste is much better fresh. Make sure you practice several times to perfect your new talent. Making pasta is a time consuming process, but is well worth the effort. Look online or in your favorite cookbook to come up with a recipe that fits your kitchen expertise. Again, try to find local eggs for your recipe, you will be amazed at the color the yolks that will make the pasta have a wonderfully beautiful hue. 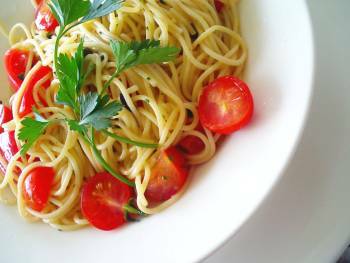 Pasta can be made in large quantities at low cost and in a short period of time. By cooking your pasta al dente before the party will allow you to finish off the dish by tossing the pasta in your warm sauce without taking too much time away from your gathering. The key to preparing your pasta al dente is to cool the pasta down to stop the cooking process. When you are cooking pasta for a crowd this step is essential. After draining your pasta, run cool water over the pasta, mixing the pasta to cool completely. Toss the pasta with olive oil and cover before placing in the refrigerator. This process will allow you time to decorate and attend to the details without having to worry about the most time consuming part of your meal. The pre-cooked pasta can be kept fresh in the refrigerator for around six hours. You will need to borrow or purchase the biggest tall pot that will fit six quarts of salted water per one pound of pasta you will be preparing. The pot will need to be tall enough to allow the water to come to a rolling boil and the pasta to move freely without flowing out of the pot. By having enough water will also allow the pasta from clumping together. Prepare your favorite sauce ahead of time as well, keeping warm until ready to add to your pasta. Toss your warmed sauce with your al dente pasta before taking your beautiful bowl of pasta to the table. So next time your thrown into cooking pasta for a crowd enjoy your time, as one should while hosting your own party.